I don't think I've ever experienced a summer this busy. I suppose that's what happens when your kids grow up. Last summer, was all about lazy days at the pool and scouring the internet for things to do with young kids. Not anymore! My kids are so busy with activities and friends. I'm just trying to keep it all straight! Add in a pool being built in the backyard, a part-time job, and a blog...it's just busy. My good intentions of organizing my house and working on some DIY projects aren't going so well. I think feeding three boys eight times a day is the biggest challenge. 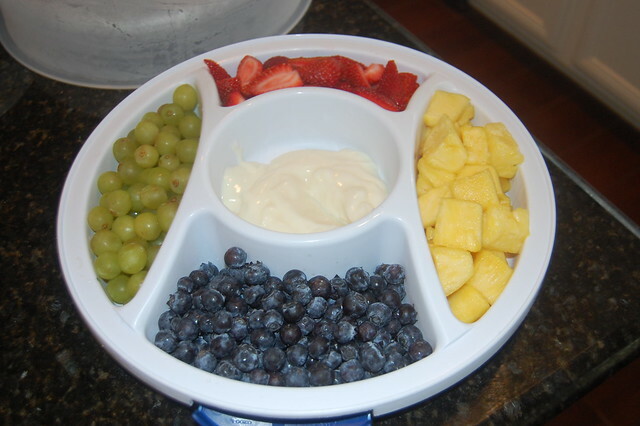 I decided they were going to eat healthy this summer, so I made a huge fruit platter to last three to four days. I was hoping they could go into the fridge and munch on this when they were hungry so I wasn't in the kitchen all day. Then, they ate every single piece of fruit you see here in a couple of hours. It may not look big in this picture, but that's a whole pineapple, a pint of blueberries, a ton of grapes, a pint of strawberries, and some light vanilla yogurt for dipping. Do you see what I'm up against? We're also trying to make final decisions about the pool. I'm looking at pictures constantly on our local real estate website, har.com, for ideas. The latest decision has been about the flagstone coping that goes around the edge of the pool. I thought I wanted a light gray with enough tan/brown to go with the brown rocks of the waterfall. Once I looked at pictures, I realized the pallet of stone I picked was all wrong. Here's what the light stone looks like. You probably don't notice much of a difference, but I really prefer the darker stone in the last two pictures. I wish I would have figured that out before we visited the stone yard. I finally just told the pool contractor I want brown stone and to get what he thinks looks good. I'm sure he has a better idea about these things since he does it every day for a living. The next major decisions are on the pool decking and the color of the inside of the pool. The decking is going to be a stamped concrete. We have to choose a pattern or texture, and a color. I have a feeling the hardest part is going to be the pool color. The samples do not look like the actual pool color. We might be traveling around to previous customer's pools to get an idea of color. I'm just not sure how we're going to fit that in our schedule. 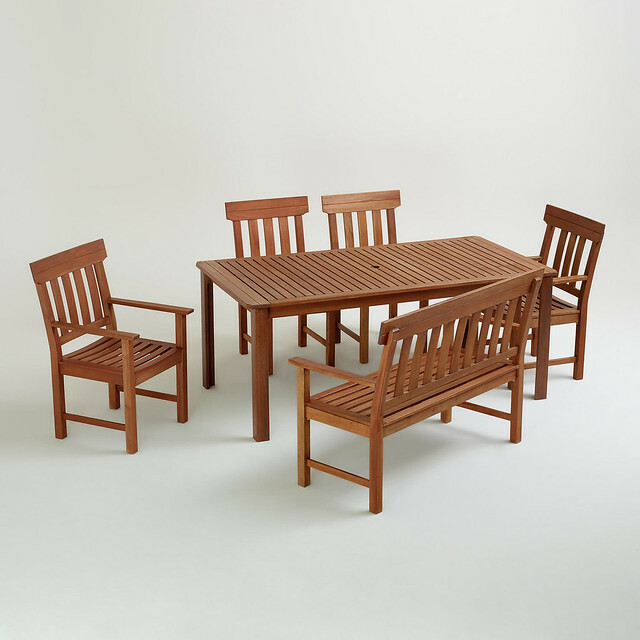 I've got the matching lounge chairs in my cart online, but I'm still in sticker shock over the table and chairs. I'll buy them. I just need a few days. I do have one project I'm determined to get done this summer. It's my kids' bathroom. I'm still in the planning stages right now. It's not going to be a major makeover since it's a bathroom to my three boys that will just destroy it. There are some rooms you want to make beautiful and others that you just strive to be clean, functional, and not embarrassing when someone outside your immediate family sees it. I'm going for the latter on this one, lol. I'll have more updates soon! Good luck keeping up with feeding 3 hungry boys! How great that they are eating healthy snacks though, just keep putting those in front. Like, every few hours. haha! You know, I love the idea of a remodel and picking out colors and finishes, but when it comes down to it, it can be nervewracking! You want it to all look good and sometimes you can't tell on a little sample - it can be much darker or lighter than you thought, or the color looks different in large scale. I think going to look at actual pools that you like and then showing your contractor is a great idea. How exciting the progress you're making! And you're right, outdoor furniture is expensive! I love the set you picked out. Lookin' good! Maybe this will work on the second try, looks awesome! Like a real pool. I can't believe all the progress they are making! Serve that fruit platter along with some cold white wine when I come over to sun. I guess I can bring the wine! Can't wait.